While working with your deals in UPilot, you might often have multiple people involved in the deal apart from your primary contact. These people may be influencers, any partners you work with, or even the final decision makers to close the deal. 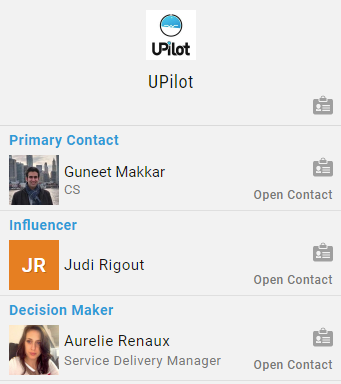 With the stakeholder section in the deals in UPilot, you can associate multiple people to each deal apart from your primary related contact. All the stakeholders added to a deal would be visible both in the ‘additional info’ section as well as on the top-left corner of your deal. By default, UPilot provides you with labels such as Influencer, Decision Maker, Partner, and Finance. However, you can also modify this list to suit your business needs. Pro Tip: If you’re looking to quickly grab the contact details of your related contact or any stakeholder for your deal, you can simply click on the VCard visible next to the name on the top-left of your deal.